If any of you lack wisdom, he should ask God who gives generously to all without finding fault and it will be given to him. “When you come to a fork in the road, take it.” This is a quote from baseball legend Yogi Berra. Yogi is called baseball's greatest humorist. There are many forks in the road of life, and Yogi is right—we have to take one. One of life’s hardest lessons is to learn that we have to live with the consequences of our decisions. That is why it is so important for us to choose carefully the forks we take. None of us are immune from making wrong choices. One of the most important skills we can develop is the ability to make wise choices. We are constantly encountering forks, bends, and crossroads. What helps me most when facing decisions and choices is to pray about them first. I know that I should never make a hasty decision. When I do, I don’t always like the consequences. Yes, every decision we make will have a consequence—maybe a good one or maybe a bad one. Many forks can lead us into deep sin. We need direction from God so that we can stay on the right path. Choosing a better fork in the road can lead us to a more godly lifestyle. This lifestyle will bring us peace and joy that we can’t find in any other way. I find encouragement in our verse for today. God gives generously to all without finding fault. God never says, “I told you so.” All of us need help in making decisions and choices. God really cares about the decisions we make. He has a plan for our lives. He knows all about us because He created us. He wants what is best for us. He knows the dangers we face. God also knows the joys we can experience when we allow Him to have dominion over us. It's a good time to make changes in our lives. 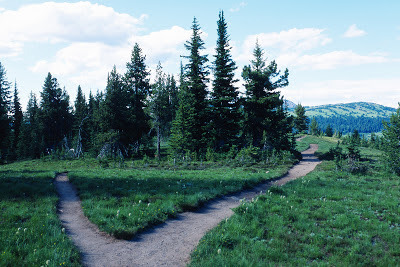 I hope you will join me in seeking God’s guidance when we come to those forks in the road.